Several weeks ago I noticed that Tory's purring changed in depth and timber. He was also slowly loosing weight, although I could only tell because I picked him up every morning into my lap while at the computer before leaving for work. Monday he didn't eat enough for me to tell that he had eaten. Tuesday and Wednesday were the same (Fuzzy eats different food, which Tory wouldn't touch). I thought I felt a hard lump in his throat, but was unsure. Thursday morning I took him to the vet. She confirmed that he had a restriction growing along his windpipe that was squeezing it shut. Thus, the change in his purring/snoring (he was working hard to breathe) and probably the culprit for his not wishing to eat. It was a hard mass along the full length of his windpipe, and there was no way they could remove it. My choices were to take him home and watch him decline for the next couple of weeks before putting down, or let him go then. I had already prepared myself over the last couple of days (hoping for the best, fearing the worst) and had spent extra special time the previous night and that morning - I held him as he drew his last breath on the examine table. This is the most at peace I have been with helping a furry friend to the end. I didn't wait too long as I did for some, circumstances didn't force the decision too soon as happened with others, I had the opportunity to help as I didn't get to for a couple of others. He went before his struggle became a burden. He looks remarkably good for a 16 year old cat who had, at best, 2-3 weeks to live. 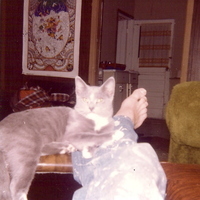 I miss my lap kitty, but know it was for the best. Prince took his last breath today and I would like to remind everyone what all he had been thru while retaining his dignity, stoicism, and loving calmeness. I got Prince as a "used" dog, He had at least 2 homes prior to my bringing him home in June of 2001. I hadn't planned to get another dog so soon, but Sampson shut down after losing his companions Bogie and Niki within 5 weeks, and my vet recommended Prince from a family that just couldn't keep him from getting out of the (loosly) fenced back yard and running in the streets. He had a plate in his right, front leg from being hit by a car in Peterborough. Missy became Prince's fast friend when she came into the household 9/18/01 and being of around the same age helped channel his energy. When he was outside, he was on a cable until he got attacked a couple of times by the neighbor's dogs (who managed to get loose a couple of times). That is when we had the fence built at the Deering house, so he could roam the yard without danger. That is the only thing that seemed to change Prince; he was always very friendly with other dogs, but after a couple of bad encounters, he would not tolerate any other dogs coming close. I couldn't blame him, and honestly, the only major accomodation was when we went to the vet we made sure no dogs were in the waiting room when we went in and out. In the last 5 years or so, he lost a lot of his sight to cataracts (although motion was a magnet for him) and his hearing was very poor, but he still moved well. He also started developing fatty non-malignant tumors around his torso, spine, and rear legs. Then the big changes came in 2013; Shadow passed, Missy had to be put down, the Ex left the house, then the menagerie and I moved to the Hillsboro house. Thru it all, Prince was stoic and accepting of all the changes. Okay, except when I tried to keep him in the kitchen when I was at work. I was gone 13-14 hours a day, so I wanted him to mess up the tiles, not the wood floor. Well, after about a week, he got tired of that and put in the most effort I have ever seen him put into anything to get out. And then he went to a kennel a couple of times while I was out of town, or while the contractors were working on the house. They obviously spoiled him and he obviously loved it. I was so glad that he was in good spirits when he came out of the kennels as I felt so guilty! He had also been on medicine since this spring for incontinence, which worked well most of the time. These last couple of months had been harder on him. Even though my work days were shorter (actually, drive time less), he could no longer hold his bladder. I got wee-wee pads, which he used most times. But the last two weeks he had also been voiding his bowels during the day, when previously he had been very regular - first thing in the morning and again after I got home from work. And his back legs have been very shaky - several times I have had to help him get up from laying down. Tonight, when I got home from work, he had obviously been in the office all day long; voiding there (wehre is previously had been in the living room on the pee pads) and he had only been able to paddle along the floor to get away from laying in the mess. I carried him to the door and helped him down the ramp so he could do his business in the yard. I debated with myself, but looking at his shaking back legs, decided he was in such pain and instability (I assume from the fatty tumors growing along his spine), that I had to make the decision and let him go with his dignity intact and not prolong things because of my needs. he is now cavorting with old friends; Missy, Sampson, Indy and Shadow- and gaining new friends; New, Bogie, Niki (who will mother him to death), Cleo (whose life was so short since she had feline HIV), Argent (Bogie's sisterm who was with us way to short a time), New (who was the most well traveled of the group), Shilo, Midnight, Black Angel, Midnight, Blackie, Butterscotch, and Fluffy. Rest in peace friend. You are out of pain, can see clearly and hear all the amazing sounds of nature. You were a great friend and I'm glad I could provide your forever home after 2 other homes found they couldn't keep you. You were a rock, so stoic and calm no matter what happened. How I will miss you! Yeah, this blog is going down the crapper. Today we had to put Missy (Mischief) down. She was a "used" dog when we acquired her in late September of 2001. She immediately bonded with Sampson as his protector against Princes rambuntiousness and became friendly rivals with Prince. she was a dog eager to please, alway happy (unless she thought you were displeased with her), and fearfull of so many things. Hoses were scary, new people, or even people she didn't see often created a submissive response. all of her neuroses were obtained from her former owner. It took years, but she blossomed. She wasn't an overly confident dog, but eventually we didn't have to have her greet people on the deck so she didn't mess up the house. She was a great girl and I will miss her sunny disposition. It has been a hard 4 weeks - an aunt and two pets have died. And husband is lost. My family is shrinking too fast. It was an honor to help Missy find some confidence and lots of joy. As tribute, here is my favorite photo of her. He is the only pet that passed away at home and I am terribly sorry I couldn't be there for him at the end. He is buried in the back yard, 30-40 feet directly behind where this picture was taken. He is sorely missed by both me and WS. I didn't mean to get another cat. I certainly didn't mean to get a cat that was 5 months old and used to having a house entirely by herself. But mean to or not, I did. About a year after I got Shadow, and he had firmly established himself as the 4th dog in the family (he would go "out" with the dogs, he would go up to the pen with the dogs (although he didn't stay in the pen), he was raised with three dogs and in fact, believed himself to be a dog), a co-worker started complaining that he had to get rid of his cat. I asked why and his reply was that the cat was to darned energetic. I knew how old the cat was because he had gotten it from a litter that another co-worker's cat had had. I asked Brian, the co-worker, what he expected out of a kitten. "But, she is just too hyper," he grumbled. 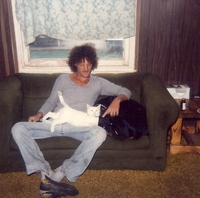 Brian should not have gotten a cat in the first place; he was rarely home, so of course the cat was frantic for attention when he was there. After a couple of weeks, Brian said he ws going to have to take the cat to a shelter. I asked why and Brian said because he couldn't find anyone to take it. This is where I got caught. I was pretty sure the shelter would put the cat down. i knew several people that had gotten a kitten from the same litter, and every one of them had tested positive for feline leukemia. Shelters will not even think about harboring a cat with that disease. However, there was always the posibility that the cat didn't have the disease - after all, the mother's owners insisted that the mother had been tested and came out clean. Anyway, I told Brian not to do anything until I talked to the Wonderful Spouse. July of 1989 I started looking for another dog. I wanted a northern breed mix (husky, malamute etc.) since he/she would be expected to stay outside while we were at work - even thru the winter. I heard of some puppies that were lab/samoyed mix, and went to take a look. The mother was purebred samoyed, the father purebred yellow lab. The owner of the samoyed was giving the puppies away, but taking donation to have her dog spayed (she had rescued the dog not too long before and was not too pleased that she had puppies). I took my time, determining which pup had just the right temperament; bold, but not too dominant, curious, friendly, and not clingy to littermates. The pups were too young to leave their mother at that time, so she marked the ear of the one I picked with a sharpie marker so I would get the right one when I came back. About a week later, I happened upon an add for a free adult husky/shepherd mix. I called the number given and discovered it was a boarding kennel. They had kindly taken in a stray, and no one had claimed it, so they were looking for a home for her. I went to look at her, and saw that she was a true Heinz57. She had droopy ears as if she had some Lab in her. 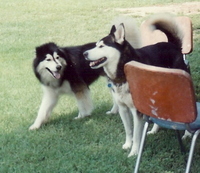 Her markings may have been the combination of shephard and husky (and others), but her undercoat and curly tail definitely pointed to husky. The poor girl had been dumped, with her leather color, but no tags. She was overly enthusiastic; as soon as the door to the kennel was open she almost bowled me over - quite a feat for a 35 lb. dog! She also had a deformed, or broken but not set, leg which made her front right leg crooked. That did not slow her down a bit. As she was busy wriggling in my lap, licking my face, and being a generally happy dog, I realized that no one else was likely to give her a home. With her crooked leg, they were not likely to notice the intelligent eyes or the unhesitating trust she gave to a complete stranger. quirks - she would not get into a vehicle. Her demeanor immediatly changed from a happy dog to one that thought she was in trouble - or worse. I picked her up and put her in the truck, where she road peacably enough, but nervously. New was a well-travelled cat. She was born in Florida, where she resided with my mother (Cop Car). Cop Car got the cat from some neighborhood boys on New Year's Day, thus the name "New" (I'm sure Cop Car will correct me if I get any of the begining parts wrong). After a while, Cop Car got tired of Florida and moved to New Mexico, taking New with her. After a while, for reasons that don't matter, Cop Car asked if I would take care of New, I agreed and New moved to Kansas. At that point, we did not have any other animals. Occasionally Omar, the cat from next door, would visit, but New didn't mind that. Omar was a well behaved tomcat that didn't try to eat New's food, he would stroll in for a little attention (probably to get away from the young child for a while), then go back next door. Another neighbor's cat, Snowball lived with us for a couple of months too. Once again, she didn't seem to mind. So, less than a year after we moved to NH, Bogie was an only dog. He was still living at the BILs house too. It was heart-wrenching every time we went over to visit. When Bogie was let off the cable, he would run to the truck and jump up and down next to every window; looking inside - trying to see if Argent was in there. Maybe this time she would be there and we would let her out to play. He was always depressed when she didn't appear. We kept looking at land, but houses were so expensive we didn't think we would ever be able to afford one. I had started working at "S"inc, where I would end up staying for 13 years. WS was working at the big Steel Company, a place he stayed for 10 years. One day WS came home and said we had to go look at a house. Someone he worked with had told him about it, and the pricewas within what we thought we could afford. The only hitch was that the house was a shell - unfinished - and had been empty for a couple of years. We went to look at it, WS swore he could do the work it needed, and we went to talk to the real estate agent. To make a long story short, after much work, the bank agreed to finance it and we moved in in January of 1989. We immediately moved Bogie from BILs place to our house. Bogie loved it there; the trees, the scents, the solitude fit him (that was way before we had neighbors). That spring, we built him a 25L x 25W x 6T pen. People thought we were nuts, spending huge money (for us) on fencing so he could have a nice large area to roam when we were away. But, we didn't want him on a cable longer than necessary. He had a cable at the front door, so we could let him out without him running off to kill someone's chickens, but if we weren't there to watch him, he was safe in the pen (if not in the house). In June of 1989, we went back to Kansas to visit family and friends. Bogie, of course, went with us. He had a grand time meeting with his sire, Leroy, again. After we got back from the trip I got on "gotta have another dog" kick. And this is where the story becomes jumbled because it morphs into a Bogie-Niki-Sampson (as O'Hara, the bird, says) story that really can't be seperated out. Unfortunately, you will have to wait a bit for that as I still haven't talked about New, the cat, and she definitely has to have her part told. Argent and Bogie were the product of the accidental mating of one neighbor's purebred Siberian Husky and another neighbor's husky (or malamut)/shepherd mix (Lonnie claimed that Leroy was a Russian Wolfhound/shepard mix but he sure didn't look like it). WS and I each claimed a puppy, Lonnie claimed one, 3 friends each claimed one. I don't recall what happened with the other ones (or maybe I am mis-remembering and there were only 6 pups). Shilo came to our apartment in Kansas with John, a room mate. She was 5-6 years old when she arrived. We weren't quite sure what to expect, us with no dogs but with one cat (New, who I will write about some other time). Shilo, despite her flaws, soon wormed her way into our hearts. Her flaws were many; John had raised her in a way that guaranteed that. One moment he would praise her (or laugh) when she did something - the next time he would yell at her or kick her. She was also (supposedly) trained as a guard dog, trained to guard John's wife and kids. John's wife lift with the kids, leaving john with his car and Shilo. The car in great shape, Shilo was neurotic. Shilo soon became my companion whenever I went somewhere. She loved to go for a ride, and would sit in the passanger seat checking out the scenery. If someone got too close to the car, she would bark her fool head off. The first time I took her with me, a neighbor and I went to the grocery store. When we came back out, she was barking so hard that I wasn't sure she would let us back in the car. Once she shut up for a moment and yelled out "Hi Shilo," she decided to let us in. I don't know what we would have done if that hadn't worked, but it did.